‘Tussenruimte/In-Between-Ness’, a solo exhibition of artwork by Jacobus Kloppers was hosted in November 1999. When evaluating an artist’s work, I believe it is of critical importance that certain criteria be met. Firstly, the artist has to distinguish himself/herself as master of the medium he/she is working in, and this mastery also has to extend to the technicalities governing the success of any work of art, such as composition, balance, use of colour and texture – to name the most obvious criteria. Generally these skills are aquired through dedicated commitment to training and exercise, and the development of a unique style and approach concerning specific subject matter. Secondly, the originality and honesty of any work needs to be beyond doubt to secure the “soul” it requires to communicate successfully. Any tricks, shortcuts or pretence are bound to ruin this essential primary quality. Thirdly, the ultimate test for any authentic work of art is its ability to withstand the passage of fashion, trends and time. This is only possible if the content of the work is pure and has been well formulated by a focussed commitment to the ultimate mood or message that the artist wants to convey. During the past five years I have had the opportunity to get to know Jacobus and his work and found that his work undoubtedly meets these criteria. His dedication to his art, his commitment to the quality and content of his work and the development thereof is most inspiring. The overall quality reflected in his works manifests itself in the fact that they are not only aesthetically pleasing, but also offer a depth of metaphorical and philosophical content when analysed and pondered over. As an art dealer I feel priviliged to offer fellow art lovers the opportunity to discover and explore the art of Jacobus Kloppers, which will lead them to his places of “inbetween-ness” from where they should emerge wiser and with enriched souls. My work is mostly concerned with landscape. However, I’m concerned with more than the representation of a piece of natural phenomena. My work is not just about picturesque rendering of land and human activities in the landscape, but about how elements in the landscape may act as metaphors for the human experience of, and interaction with, a place or territory. During the early 1990’s my paintings explored features in the (mainly) Karoo landscape that represent human habitation. These included fences, gates, sties, water troughs, feeding troughs, reservoirs and the “takkraal”, or kraal made of branches. They act as objects for the imagination. They are portrayed as more than just the “real” but as metaphors for the cultural “mark”, i.e. the marks drawn, scratched or painted by an artist. At the level of content these metaphors can be interpreted at both an existential level – for example, representing themes of primordial religious experience and the human encounter with the elements – and at a level of historical experience, reflecting themes of cultural identity, territorial identity and social change. In order to portray these features as something different from what is seen in the traditional pictorial landscape, I employed particular devices: the square format the birds eye view, leaving evidence of process e.g. compositional lines and marks around the border and placing the object in the centre with centering marks visible at the top, bottom and sides. I call these works open metaphors and want the viewer to read them as such. They were mixed-media works on paper, as well as oil on canvas. During this period I sometimes included found objects, as an installation in an exhibition. The example pictured below was part of an exhibition during the Grahamstown Festival in 1995. Since 1997 I am focussing in these Karoo works on the farm dam (zinc and cement). Still the format is square, with the dam cut off at the bottom and one side. The edge becomes a b o rd e r between water and veld, full and empty, wet and dry. The content refers to issues such as survival and territorial ownership (heartland, inherited land, etc. ), explaining titles such as “Vont” (as in container of baptismal water). During a trip through the Karoo and Richtersveld in the winter of 1996, I stumbled upon the idea of using the journey itself as a motif. The road, the most obvious manmade inscription on the landscape, can be seen as a place in itself, a place in transit. During the journey in the Richtersveld, I installed a site-specific artwork. Two rows of white local stone were stacked across the dark red “ misvloer” of a “bok-kraal” (used by the local nomadic farmers) to create a passage. Place or journey and destiny becoming one. Earlier in the same year, during a brief visit to Europe, I encountered some of the work of the German artist Anselm Kiefer. His works made a direct impact on my thoughts about the “landscape”. It explained how the landscape can play itself out through the use of signs, symbols and historical references. Since 1997, my focus then shifted to the process of exploring inscriptions and elements in the landscape. I started using the video-camera, recording my passage through space and time. The road and related objects such as road markings, road signs, milestones, maps, etc. became the subject matter for metaphor. The contrast between a thick tactile painterly technique, and an ephemeral electronic image with its telephoto distortions, blurring, colourbleeding and electric light, became a metaphor for the impossibilities of capturing time of understanding “passage” itself. The road, the freeze-frame captured moment becomes the journey. It is the never ending invitation, the space between past and future, the known and the unknown, the creative incident itself. It may further signify the search for an understanding of spirituality, identity and territorial belonging. Perhaps it is also the great escape from the terrors of history. The ultimate but elusive destination, never quite reached and there f o re never to be understood. In these works, I use the rectangular and sometimes the “pana-vision” format to indicate these shifting, moving and accidental qualities. In an exhibition at the Oudtshoorn Festival in 1998, I installed a complete topographical map of South Africa, in the shape of a cross (as in marking with a cross) on the floor. A small mirror, with an opening or window in the shape of a cross, was mounted on four wheels and could be moved over the map. People were invited to find places of interest to them, by looking through this opening. They could see not only the markings on the map, but also a reflection of themselves. 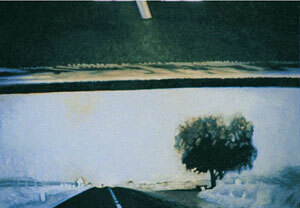 In my most recent work, I’m using actual signposts and road signs as objects onto which I’m painting images of road. I’ve also started using actual used tarmac as sufaces to work on, but also as images by itself. These surfaces with their creases, scouring marks, edges and textures signify testimonies and experiences of “journeys” and simultaneously the “singular place”. In these works about the non-place I try to force the viewer to experience a moment, rather than a place. The viewer does not think, therefore he or she is nowhere and everywhere. Diaspora is our relationship to places of imagined belonging; it is the history and questioning of the path and its sense of place; it is the road longing for its landscape. Here now, in this place the roving eye. But all’s not here! What is it then, this place between, this matter of the road? Here amongst these intimations, allusions to the road-as-place, we may be led to ask: “What then is place itself?” The question hangs in landscape, ill at ease, but is given thought in the artist showing place ‘at once’ effaced and affirmed. And in making road itself the seeming subject. Sign and roadside spot, are as beacons, marking singularity. Not so the road itself, its ungiving surface apparently too featureless for encampment. Its fissures too shallow, folds too closed. The surface in its unresponsive presence states its place, if place at all, behind the gaze. So this apparent place of places, is ‘place-as-stage’, not place itself. Suspended in a slipping moment, trailing time, we are offered glimpses of a fuller world of which we might not need to ask: “What hinting presence here?”. But what is given here is given not enough, and lends scarce sense of situation. It is as incident shuttered from its context, and now both are mute. Traces of moments lived, directions lost and found, efforts exercised, now fading as form gives way to field, and situation to landscape. It is this very challenge to the present’s form that seems the subject here. Thus it does not surprise that the substance of the road, the very real, the tar itself, becomes as pure abstraction. And it is here the artist finds his subject, presence and demise. The moment takes, and in this moment fades the promise of a given place to think and feel. These willy-nilly makings of the moment’s eye seem now as ghosts in meaning’s moment. But this decries the day and commonsense, the self-evidence of the present and the generosity of its meaning. It is as challenge to what we thus seem to know that these images find their appeal. Now presence in its showing, in its ordinariness, becomes ephemeral, once there or yet to be. What stops us is that presence ‘glances’ and does not hold in frame. Notable as it is, this refusal of time and space, its deferral to lives once lived and to places of rest and longing, it is too fecund to be called indifference. Indeed this ordinary glimpse is not unmoved, and it sets upon its quarry. But what is found? To give to what appears its own intrinsic sense of place, the artist pays his dues to that which may have had its presence, before he came to stake a meaning claim. Faithfully recorded are the accidents of the lens, the impingements of the periphery, the inscrutability’s of the screen. Indeed they are given framing precedence, not as charming accident, nor as painter’s muse, but as that itself, the witnessed world. Staged as if to say “Let it be, what there appears”, and let is serve to show the very play of finding-making. And it is precisely in the facts of what is there, rather than in the semantics of the beautiful, or the picturesque, that the artist tries to make his exit. Of course he can’t, but try he will. Now in this play we find, not he, but us in place. What is there, its qualities of time and place for now aside, is not remarkable, not particularly redolent with meaning, except insofar as road means journey or some such easy meaning find. Beyond this what we see is born now not by features, or their absence, but above all in our looking. Now we, not the landscape, are the giving presence. Not the artist’s eyes, but ours, and it is this repeal of meaning making-finding, that gives us place, and has us floundering with the present. Here now is us and our being drawn to see. Here theatre, here image of the gaze itself. In this enactment we might say is fulfilled that which once seemed image, but was not yet there as it was beyond the artist to complete. Now in this humanising landscape heat is warmth, horizon is hope, signs speak, places arrest, and left alone as idle amusements are these questions of absent-meaning. Here no longer do we stall to see, to know. Ecstasies of presence now interweaving with reaching and the lingering moment. Tar now as Milky Way. And now again shows God, light bound in mirror’s hesitation. Strung between the landscape found and lost. Again the signs are rendered, yet each without its certainties, as if to say may-be. Now in road’s enchantment we know at least that we are here, but should we not still say quite wherabouts unknown.